Here is our listing for T Register event for 2019. The T Party date and venue has now been decided so we now have a full list of events for 2019. 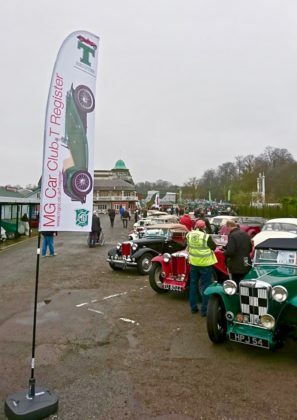 The T Register will once again have a stand at the International MG and Triumph Spares Day at Stoneleigh Park. The video below was made at the 2018 show. Seen as the season opener, it’s where to get the parts in preparation for Spring and for you to use the T Register stand to sell your unwanted parts to a large number of enthusiastic buyers! There is a form to complete to list the spares you want to sell. You can see more about the show on the International MG and Triumph Spares Day website and buy tickets from there. The British Motor Museum is a popular choice for members for the T Register’s annual Rebuild event and once more we have a booking there for 23 March. Entry will include admission to the Museum and we will keep you well fed and watered with coffee and bacon rolls on arrival together with a buffet lunch and tea and coffee throughout the day. There will be two morning sessions with one in the afternoon plus a Question and Answer session. It will be followed by the T Register’s AGM and we would encourage you to stay for this! We do keep it short and to the point. We will have seminars from Ian Aisles on what he learnt whilst restoring his TD, Ron Gammons on installing wet weather equipment, and Eric Worpe on painting your T Type The cost will be £45 for MGCC members and £49 for non members. You can download an application form to print out, or, as last year, you can now complete an online form, and pay by bank transfer. If you click the image of the poster at upper left, you can download the full poster for the event which includes the timetable. There will be a Bring and Buy stall to sell your unwanted spares as in previous years and there is a form for you list your items to help us on the day. Information on the event will be updated here on the T Register’s website. In the meantime, for more information, email Barry Knight or telephone him on 01252 875740. 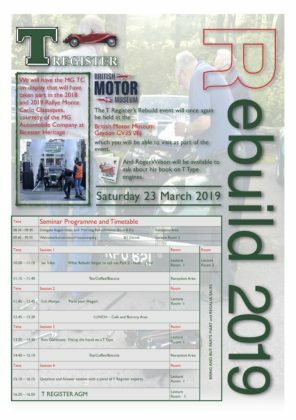 The AGM of the T Register will take place immediately after the Rebuild Seminars at the British Motor Museum, Gaydon, CV35 0BJ, at approximately 4pm. or by e-mail to treg.sec@ntlworld.com by the same date. For the 2019 Spring Tour we have decided to go back to the Ferme de la Rançonnière in Normandy. Those of you that came in 2016 will remember that the hotel is in an old farmstead, with plenty of parking inside and behind the hollow square of buildings. The accommodation is on three sides of the courtyard: there are no lifts, but some of the rooms, as well as the dining room and bar, are on the ground floor. The photo gives you some idea of what it’s like, and there’s more information on their website. We have a very similar offer from the hotel as we had last time so once again we’ve decided to go for dates in April rather than our more normal May. This means that the price is considerably lower than it would be later in the year – and the hotel staff say that the weather in the area is usually better in April than it is in May, too. Date: 8th to 12th April 2019 (four nights). Single 105€ per room per night half board. These prices are for ‘traditional’ or ‘superior’ rooms – other grades of room are available, and may be bookable at a supplement. As usual we plan to have a slightly more upmarket meal on the last night, for which a small supplement (last time it was something like 12€ per person) will be payable. The nearest ferry is Portsmouth – Caen (about 30 km from Crépon). Other possible ferry routes are via le Havre or Cherbourg (both about 110 – 120 km), Roscoff (about 365 km) or Calais (about 375 km). There’s lots to see and do in the area, from visiting the Normandy Beaches to following the ‘cottage trail’ – honestly! It’s set up by the Tourist Board and goes through lots of pretty villages with thatched cottages. You can visit the Bayeux Tapestry or go and see a cider maker if neither the beaches nor the thatched cottages appeal, and there are loads more ideas on the web. For those of you that enjoy driving, the area known as la Suisse Normande is fun and not that far away: the apple blossom in the cider orchards should be lovely in April, too. The T Register Spring Tour to Normandy is already full but of course there’s always a chance that someone may drop out, so Sally Silcock is keeping a reserve list just in case. The hotel requires a 30% deposit on booking. This amounts to 180€ for a double/twin room, and 126€ for a single room, which converts to £162.00 for a double/twin and £113.40 for a single using a conversion rate of 1€ = £0.90. The hotel has previously been relaxed about returning deposits if a cancellation has been necessary, as long as it wasn’t at the absolutely last minute. After 2017’s last-minute change of hotel, which meant we needed an extra visit to Belgium to sort things out, we have reluctantly decided that we will have to charge an entry fee to cover our expenses in setting up the tour. This will be £10 per person, and any surplus will be used to subsidise a festive dinner on the last night. As a result of the above, please pay us a total of £182.00 per double/twin room or £123.40 per single room when you return your registration form. In order to be sure of a room, you need to return your form and deposit before the end of October, as we have to pay the deposit to the hotel by 1st November at the latest. You can either send us a cheque with a paper copy of your completed form, or (and preferably) return the form by e-mail and pay us by bank transfer. To get the booking form, please email Sally Silcock. Please make sure that when you complete it, tick the box to confirm that you are happy to share your contact details with other participants (provided you are happy to do so, of course) – this is necessary because of the recent tightening-up of the data protection regulations. T Types are always welcome at Brooklands Museum and even more so at their MG Era Day. Our committee member Alan Wakefield is also a Brooklands member so he always makes sure our cars have a good spot. This year Brooklands will be celebrating 95 years of the MG Marque with displays of cars through the 10 decades of MG production. The display of cars around the Octagon badge in the Paddock will feature a car from each of the first 8 decades of MG production, with cars from the 2000s and 2010 joining them. This will include 9 T Types representing each model, and there will be dedicated T Type parking as well. For details about this, contact Alan Wakefield. At lunchtime, there will be a chance to see some of the cars as they parade around the circuit at Mercedes-Benz World, with ascents of the Test Hill during the afternoon. There will also be a Concours competition for the ‘Best MG of the Day’. Parking for MGs only will be on the Museum site – access is through the Campbell Gate off Brooklands Road (the B374). Visitor parking will be in The Heights off Wellington Way or in the car park at Mercedes-Benz World. You can see all the details including ticketing on the Brooklands Museum website. MG Live will not take place this year. There’s not a lot more we add to this unprecendented situation, and we have deleted most of the information below about what was happening at this year’s event. The plan for MG Live was that in its third year of gradual improvements and there would have been changes again for the 2019 event with a closer arrangement of the CRB stands to the main club stand and the Village Green events area being more compact to give it a friendlier feel. There will again be an increased emphasis on the infield activities including the auto solo event and Village Green areas. 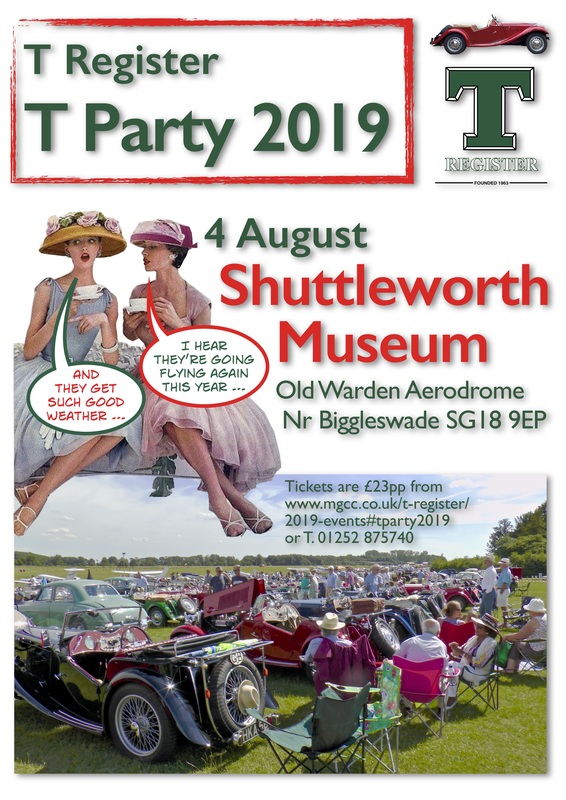 We have decided to return to the Shuttleworth Museum for this year’s T Party. It has always proved to be a popular venue for people in the past, and although Shuttleworth no longer have a ‘Wings and Wheels’ event, they do have a large Family Day flying event which is what we have chosen to attend. We will have dedicated parking and we have obtained a discount on the normal entry price. 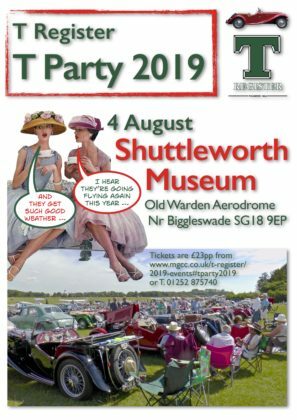 You can see more about the Shuttleworth Museum on their website, and you can see the T Register’s album of pictures from the last time we had the T Party there in 2015. We will be handling all the ticketing for the T Party ourselves and booking is now open. There is a paper form you can download to complete and post off with your cheque, and an online form for registering for the event with instructions for making a bank transfer to the T Register. You can find out all the details by emailing Barry Knight. The cost will be £23 per person (note: not per car) plus a £1 posting fee per booking. Yes, Rutland! A little visited (for us) part of the UK that actually is very picturesque with great T Type driving roads – and is within easy reach for many of our members. We will be based at the Haycock Hotel in the attractive village of Wansford. The village is situated on the River Nene and is very close to the Nene Valley Steam Railway (oh joy! I hear some cry). The hotel has 48 rooms and we can book all of them. The cost for the hotel will be £140 per night for a double/twin room and £106 per night for a single room, both for Dinner, Bed and Breakfast. There will be a gala dinner on the last night, for which a supplement will be payable. We will publish the details of the latter when known. The booking with the hotel is now open. You will need to book directly with the hotel using a T Register booking code and pay a 10% deposit. To get the T Register booking code, please contact Sally Silcock T.01525 750468‬ with your details and MGCC membership number and let her know once you’ve booked so she can keep track of bookings. She will also be keeping the master list of Tour participants and keeping you informed of the latest news for the Tour. Registration forms for the Tour are now ready and will be sent out to those who have booked with the hotel. There will also be a Tour entry fee of £50 per crew to cover cost of planning the routes and producing the road book etc.